Westcave Preserve provides a unique patchwork of different habitats for resident and migrant bird species alike. Many of these species are neotropical or grassland birds which have declined dramatically over the past 40 years in North America. In the fall of 2015, Biologist Dawn Houston and conservation staff began implementing avian monitoring programs, intended to census bird species present at the Preserve. Monitoring these bird populations provides information about status, population trends, and response to land management practices. The survey methodology used is spot-mapping. During spring, breeding songbirds mark their territories by singing conspicuously to their surrounding neighbors. 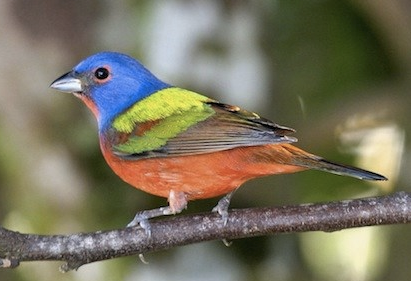 Using this behavior, researchers are able to delineate and map individual bird territories. By doing so, it is possible to estimate abundance and distribution of birds in relation to habitat use on the Preserve. For more information about bird survey methodology, download: The Handbook of Field Methods for Monitoring Landbirds. One of the more celebrated bird species at the Preserve is the endangered Golden-cheeked Warbler (Setophaga chrysoparia). Every spring this warbler species returns only to the Texas Hill Country to nest and raise young. Westcave Preserve provides the unique habitat required to sustain this species’ population. 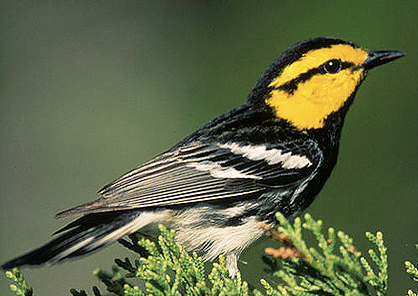 As part of a focused effort for avian research at the Preserve, Biologist Dawn Houston and conservation staff implemented a species-specific monitoring program for the Golden-cheeked Warbler. In order to accurately monitor the Golden-cheeked Warbler, surveys are conducted by spot-mapping throughout the breeding season. Detailed information is also gathered to determine nest success and survivor-ship.